This post is a wee bit late, but I didn´t have time until now to get somewhat decent pictures for this. I have been finishing off some stuff I have wanted to make for a long time, and I have made some stuff just for the fun of it! First and foremost: I have finally finished my swimsuit. This was originally a part of the Summer Essentials Sew-Along. 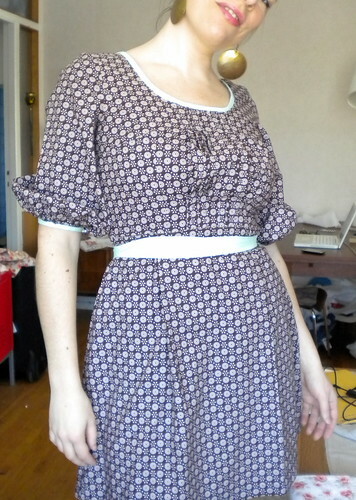 The first version of this turned out too small, as the fabric I used didn´t have the same stretch as my muslin. you live and learn! The pattern for this is based on a pattern from patternschool.com. If you´re not familiar with this awesome page, and you´re interested in sewing with stretchy materials, I recommend you go over there immediately! It´s fantastic. 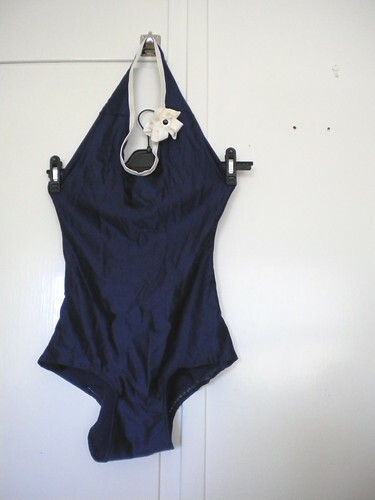 I am very happy with the shape and fit, and can´t wait for summer, so I can swim in the sea in my new swimsuit. Next up is a modified version of the skirt from Vogue 8604. 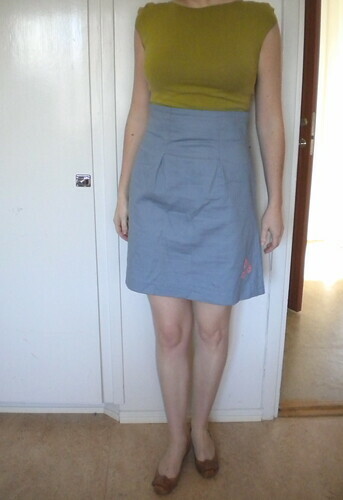 The original skirt is a pencil skirt, and has darts in the waist, I made mine A-line, with pleats in the waist, and I shortened it quite a lot. This is part of My Grand Plan, I used some cotton twill, bought six months ago. The picture doesn´t show it well, but I´ve crocheted some pink flowers, and stitched them onto the right front of the skirt. The third item I´ve made, is the Wax Print Skirt, also a part of My Grand Plan. The cotton is a wax print I thrifted back in May or June last year, and the pattern is from the April issue of Burda magazine last year, pattern number 111. It´s very difficult to photograph this skirt, it´s got a huge bow in the front, that makes it quite distinct, but that doesn´t show well on photo. This is a pattern for tall gals. Thanks Burda! 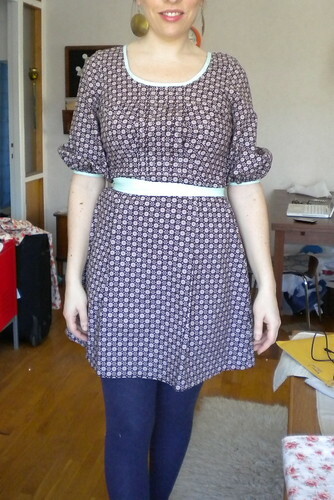 This dress is one I´ve been wanting to sew up for a long while, but just didn´t get around to make until now. Another garment that is difficult to photograph, but I´ll talk you through it. It´s got tucks both on the front and the back of the bodice, bias bound sleeves, neckline and belt, and two big pleats in the front and the back of the skirt. It is quite short, so if I´ll ever make it again, I´ll probably add at least 15 cm. This version is made from a cotton fabric that is quite stiff, but still a bit stretchy, I´m sure this would look lovely in a material with more drape as well. The pattern is from scandinavian magazine Kreative Kvinner, an issue from 2007, I think. The next two pieces I made so that I could have some comfortable travel wear. Both are made of rayon jersey, and are super comfortable. The green one (Simplicity 3503), I actually made in January, but forgot to post;-). These dresses are great for traveling. They take you through the airport security without a beep, still look more stylish than sweatpants, and are easy to wear while on board the plane for many hours. I have to thank Ali for this idea, as she did something similar last year. All right, folks, that´s all for now! I´ll soon be back with some spring and summer projects. Lovely! I love them all! I am super impressed with the swimsuit! Adorable swimsuit! Must.have. that green plaid fabric you made the bottom dress out of. Where did you get it? 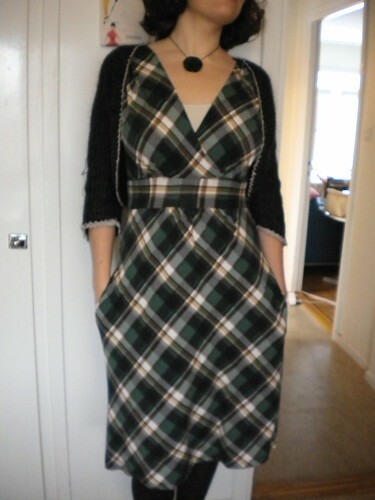 @CGCouture: I got the plaid fabric here in Sweden, at a sale at Ohlssons tyger in Stockholm. Solvi!! So much gorgeousness!! The swimsuit is a triumph (I am completely envious) and I love the A-line skirt with the crochet flowers and the beautiful plaid dress. I really like the dress with the tucks – so pretty. I am in awe of your sewing skills! holy cow solvi, it’s all so gorgeous!!!! ha ha! you’ve finally completed your summer essentials! 😉 or: you’re early this year. as always, incredibly impressed! how did you make that skirt an a-line (i have that pattern as well, and yours turned out great!)? and of course your knit dresses immediately had me looking for the patterns, i love love knit dresses. You’re right, they’re perfect for travel. Super comfy, and you still look pulled together. How are/were your travels? @Ali: Hehe, better late than never, right? The transformation of the skirt was quite simple, I reversed the darts, and made them pleats in stead, and then I just widened the skirt pattern in the side seam, I can make a tech drawing if you want to. 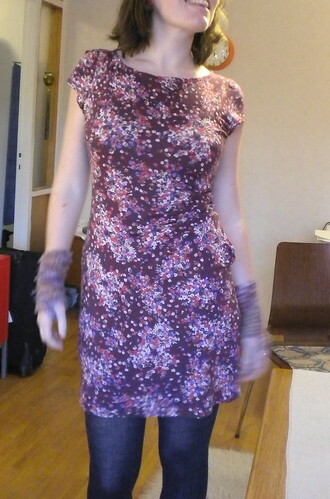 And thanks for the idea of knit dresses! That swimsuit looks absolutely gorgeous! 🙂 I also love the little embroidered flowers on your grey skirt and the plaid dress!